A full season of using and abusing both of our Versys motorcycles, especially the black test mule, has done nothing to diminish our feeling that Kawasaki has created another trend-setting, long-lasting, value-added model. The Versys continues to bring on the smiles, mile after mile, day in and day out. It really is as simple as that. That includes commuting in heavy traffic or tearing through the 508 and 511 twisties on the way to Calabogie. Riding the many gravel and dirt trails that abound in the Lanark Highlands. Or just making some sedate high-speed point to point trips on the highways and interstates, the Versys has taken everything in stride. Both units continue to be stone reliable and inexpensive to maintain. Outside of the ever-growing farkle list (see below), neither the black or orange motos have required — nor have they been given — much care and attention beyond their first 1000km (600 mi) check. Each machine has had two chain adjustments, one during the first 1000km check and the second when the tire changes were made. Along with periodic lubing of the chain, some WD40 on critical pivot points for lubrication and to help keep everything cleaned out and the odd wash now and then (mostly then) — that’s it for both of them. One thing is for sure, they are very easy to work on and in speaking with the shop tech, the motor is extremely reliable and maintenance friendly as well; for example, the inspection interval for the valve train alone is 24,000km or 15,000mi. 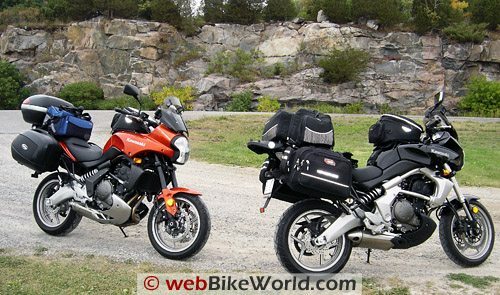 Even though we did never did get away on an extended trip on either Versys, both of them have been subjected to two and three day trips, typically well-loaded and always run hard, on a variety of surfaces. Neither has consumed any oil whatsoever, and gas mileage is typically in the 55 to 58 mpg (Imperial gallon) range. In return for such loyal and continued service, some rewards were in order, as identified in the original Versys – Part II: Christmas in July article. Two Vario Touring Screens by MRA (sold as a Kawasaki accessory, but available from other MRA re-sellers). 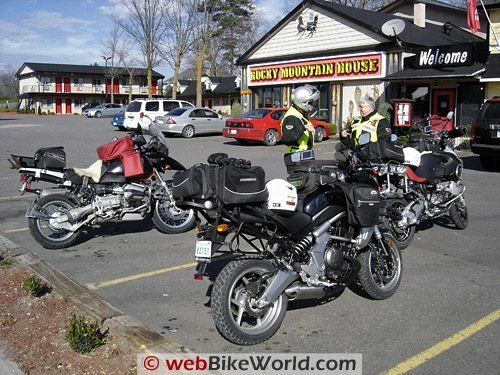 Two Givi Monorack FZ447 and PLX447 Sidecase kits. A Givi Monokey V46 Trunk in basic black. And a RAM-B-309 Series mounting assembly for the Garmin zumo 550 GPS units. As well, the Ebony test mule was upgraded with a set of Pirelli Scorpion Sync MT 90 tires before it was delivered. Since then, a second top-case (a 47 litre Kappa trunk) has been acquired so that a locking case is available for each rider to secure their helmet and other gear. The Kappa trunk does have a slightly different shape, hence the difference in the capacity rating. Otherwise, it is a virtual clone of the V46 unit for fit and finish, albeit somewhat less expensive. And yes, we get maximum use out of our luggage. All of our fleet, less the 2007 Z1000, can use either the V46 or the Kappa trunks, and over the winter, the BMW F800ST will be the beneficiary of a PLX kit as well, allowing the V35 bags to be used on it as desired. If all goes well, we’ll have another set of the Givi V35 bags anyway. 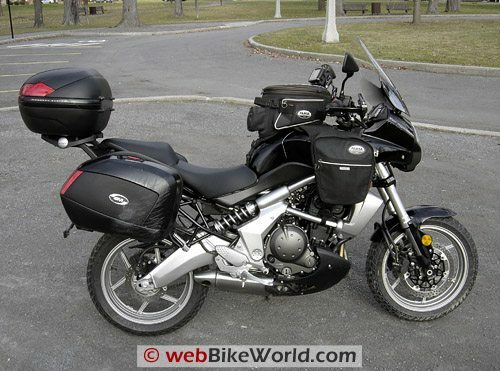 The textile saddlebags on the Ebony Versys were a set of the Givi T421 Throw Over Panniers, also sometimes identified as Voyager Bags. A frame is not needed to mount the soft bags, although one needs to make sure that the bags when mounted and loaded, will not interfere with anything on the frame or back wheel, etc. On the Versys, given the trellis-frame construction and size of the bags, they can be secured using the supplied straps, although the signal lights, in their stock mounting position, will be up against the rear of the bags, but they flex a bit, so its not a big issue. If one did have the Givi PLX pannier mounting kit, then the signal lights are relocated back somewhat using the supplied brackets, and the soft bags would just fit over those frames and then be secured…but the frames are not really needed. The objective of all the farkling or accessorizing is, simply put, to see just how complete and versatile a package can be built up from an already very competent motorcycle. In Europe and the U.S., the Versys is slotted into the Dual Purpose category, while in Canada it is marketed under the Street/Touring category. After running both of them for a full season, the category is not extremely important – the Versys has already broken most of the stereotype molds anyway. Looking forward, we know that current, and future, owners will continue to discover the many highs (and possible lows) of the Versys in their own time and space. The primary objective of this submission and associated “Quick Look” articles is to help those current and future owners decide the what, when, how and where. Outside of the accessories identified above, nothing much else was done to the Versys during the rest of the riding season, mainly because we just wanted to keep riding them and we also wanted to make sure that our initial accessory baseline was a good one. Without any hesitation we can state that it is. Besides the mirror issue, nothing has loosened, broken or fallen off. The left-hand mirror on the Ebony bike tends to loosen up from time to time (largely thanks to Kawasaki’s current mirror mounting implementation which is present on a number of models). The only other issue has been a sticky release latch on one of the V35 side cases, easily fixed with some cleaning (off-road crud had accumulated inside the push-to-release mechanism). All in all, it has been pretty smooth sailing — er, riding. Less the mirror issue, the dealer reports no major concerns have been raised by other owners. Indeed, in speaking with some of them, they are as enthusiastic, or even more so than we are about the motorcycle. Other owners are well down their respective farkle lists: many of these items are similar to what we have used, while other installations are totally different, i.e. tank bags, tank panniers, engine guards, other top-cases and the list goes on. Outside of the under-frame exhaust system, there is not much else on the motorcycle in the way of obstacles to designing and executing a wide range of street, adventure touring or on/off road accessories. In appreciating everything the Versys has to offer, it was a given that the Versys was going to generate a lot of interest, both from consumers and the accessory industry. Kawasaki really helped kick off the accessory thing by releasing a short list of the most highly desired items right off the bat. Admittedly the North American offerings are largely based on the European accessory list, which was farther along the market path. However, there is little doubt that Versys owners are going to have many more reasons to smile as the accessory list gets longer and longer. Even though the riding seaon up here went into a serious (early) decline, most of the priority items on the growing farkle list got installed and relatively well tested. That’s all before the (really) bad weather sent us scuttling into the garage, whining over the rotten riding season deal we got this year. 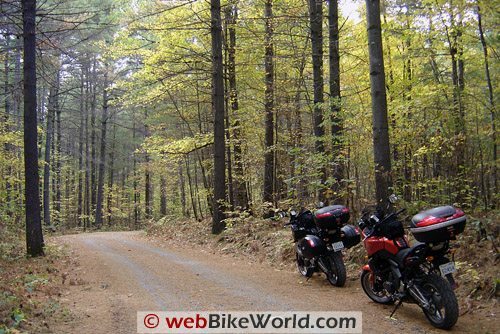 Admittedly we have been spoiled somewhat, especially after last year – many of us (and not just Beemer riders) were out enjoying the fall-like weather before Christmas and again in January and February during some warmer breaks. Another bonus was provided in March when upon our return from Daytona we off-loaded the motorcycles and within a few days had started riding again for the season. This second round of accessorizing was all done during the fall of 2007. So far, everything seems to be working well, individually and collectively. We were extremely happy to get some of the accessories installed, as it made riding in the ever-falling temperatures much more pleasant, thus extending the Versys riding season by a fair margin. Followingis a brief paragraph on each of the latest accessories installed on the Versys. Givi D405ST Windscreen (Review): This is definitely the stylish way to gain substantial rider and passenger protection. It mounts up in minutes, allows three height adjustment options and just plain works. Pirelli MT60 Corsa Tires: While installing the Givi windscreen provided the biggest immediate gain in rider protection, installing this set of tires provided the biggest increase in the Versys fun quotient. They look different, they feel different, but they sure do work. Zeta Armor Handguards Straight Kit: This kit, along with a set of black Zeta XC Deflectors is a real test installation. Although a bar-end insert mount kit, they have been bolted directly to the ends of the handlebars along with a smaller and lighter bar-end. They are very solid and with the deflectors mounted, very effective. The incorporated LED light strips, once wired up, will provide a nice (bright) safety addition to the front end. Oxford Hot Grips: We reported on the Oxford Hot Hands a few years ago in this webBikeWorld article, but I’ll describe how the updated Hot Grips work on the Versys. Despite riding for a great many years without the benefit of any heated handgrips, the de-rigueurheated handgrips on both the R1200GS Adventure and F800ST are very much appreciated, especially this time of year. FAMSA 260/7 Tankset: From swapping stuff between motorcycles all these years, and in eyeballing the Versys one late evening, we figured one of the FAMSA tankbags mounted on the Adventures would be a close to perfect fit. Five minutes later we were proven right – even the fuel filler cutout on the tank pad lines up. Given another five minutes and the unused R1200GS tank panniers were zipped on and…the adventure touring look was now complete. Are we finished? No. There is an ever growing list of accessories, some of which could be classed as essentials rather than farkles, that we would like to evaluate for use on the Versys. With the Versys now available in the US, the after market product listing is sure to take off. This is a good thing. Given the VERSYS-tility of this outstanding 650 twin, we think that the currently installed or tested accessories is a good sampling of what many owners will look for. Owners will of course, tailor their machines to best use or taste, both of which are major drivers in the aftermarket accessory environment. With winter here and mucho snow on the ground, there is time to reflect on what has been done, what could be done or, left to be done in expanding roles for the Versys even further. We are hopeful that with spring, there will be a greatly increased product offering allowing additional accessories to be installed and tested. Stay tuned. A Happy New Year from all us hosers up north, eh? From “P.N.” (9/08): “I bought the Kawasaki Dealer sold bags but was only given the option of the side or top bags, but not both. I went with the side bags and later e-mailed Givi for ideas to add a top bag, with an answer I didn’t care to hear: I’m stuck. H.B.C.’s Response: “Paul, despite what your or any Kawasaki dealer might tell you, the Kawasaki branded accessories, that are supplied by GIVI, will allow both the sidecases and a topcase to be fitted. Outside of any changes that might have been made to the Versys marketed in your country…then both kits can be ordered from Kawasaki or from GIVI. I have seen differences in some country sites regarding availability of the two kits, but again, the two kits will fit together, unless GIVI has just made a change to the kits, which my supplier says has not happened. The Specific Monorack top case kit is GIVI 076-FZ447, and the Tubular side case holder kit is 076-PLX447. For a top case I would recommend the V46 Monokey unit, although you can use something smaller, or larger. The side case kit can only be fitted with the V35 Monokey side bags, with or without the coloured insert to match your machine. Both kits can be installed individually or together and you don’t even have to remove the grab rails, contrary to what many will say. The kits are pretty straight forward to mount up, though the instructions are/were poor. Working with the kits can take both hands, or some help, so it is best to loosely install the components from both kits together to make sure everything lines up, then tighten it all up in the order listed in the instructions. If you are getting contrary information from Givi, or a specific dealer, please let us know…my local retailer has a good rapport with both the Kawasaki representative and the GIVI representative – they would love to have this type of feedback. From “K.K.”: “In regards to your article “The Kawasaki Versys Part 4: Accessories and Farkle for the Versys” you talk about the mirror issue. I wanted to comment on this and I am including what I posted on versys.co.uk that solved the mirror issue for me. I, like others, found the field of view provided by the stock mirrors lacking. I could not see behind me through the mirrors without moving my arms. I looked at bar end mirrors and did not like the way the stuck out and if I split lanes (filter for those across the pond) I was afraid of loosing them. Other bar end type mirrors required cutting the grips and mounting them at the end of the bars but these reduced the space for my hands and with winter gloves that was unacceptable. I also looked at mirror extenders but they looked weird and I was afraid the mirrors would vibrate even more. So I looked at a lot of bikes and tried different mirrors on my Versys. As a result , I found a solution for the narrow mirrors on the Versys, at least for me. I put a set of mirrors from a Triumph Triple 1050 on my Versys and the problem is solved. These mirrors stick out a little over 1 inch more than the stock mirrors and I can see behind now. They are also black, have an oval shape, look better, and do not seem to vibrate as much. Here are the Triumph part numbers: LH – T2060050, RH – T2060150. The total was $140 USD. Make sure you get the mirrors with the adapter (it should be included) since the male end on the Triumph mirrors are bigger than the female mount on the Versys. Don’t forget to take the rubber sleeve off the stock mirrors and put it on the new mirrors.